Several years ago, before America’s opioid epidemic became front page news, Dr. Nady Hamid remembers listening to a patient describe his struggle to overcome prescription drug abuse after shoulder surgery. The man was back for a second operation — but this time, he didn’t want opioid painkillers during his recovery. 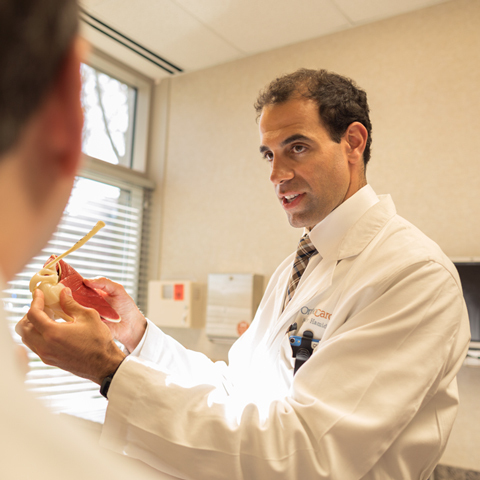 Dr. Hamid, a surgeon at the OrthoCarolina Shoulder and Elbow Center in Charlotte, prescribed alternative medications. To his surprise, not only did the patient recover well, he recovered faster and with fewer side effects. Today, Dr. Hamid is leading ground-breaking research on opioid-free pain management in hundreds of orthopedic patients. The goal is to help the medical community target the nation’s drug crisis by learning about improved protocols for patient care. A 2017 grant from The Duke Endowment to the OrthoCarolina Research Institute is supporting the work. Since the mid-1990s, potent opioids have been commonly prescribed as the best way to combat pain, but they are highly addictive and carry a serious risk of overdose. Recent studies show that patients who use opioid painkillers even briefly after surgery have a 50 percent chance of still using them five years later. In North Carolina, four cities are in the country’s top 25 when it comes to abuse rates; Wilmington is ranked first. The Duke Endowment is focusing its funding on efforts aimed at limiting opioid use and providing treatment to newborns exposed during gestation. “With abuse-related problems significantly hurting the health and well-being of our communities, we’re concentrating on where we can have the greatest impact on changing the trajectory of addiction in the Carolinas,” says Charlie Lucas, chair of the Endowment’s Committee on Health Care. In Dr. Hamid’s research, the Endowment’s grant will help establish evidence-based strategies to eliminate opioid use in five common orthopedic procedures. Physicians, nurses and anesthesia teams — and their patients — will learn about opioid risks and alternative treatments; new guidelines will be published and promoted nationally. Dr. Hamid is using insights from a successful pilot to design the work. With strong research connecting dental disease with diabetes, heart and lung diseases, stroke, and low-birth weight, we know that oral health is a critical part of a person’s overall health. We also know that with adequate preventive care and education, dental disease is 100 percent preventable. But many people in the Carolinas, including those with Medicaid coverage, struggle to access dental care. 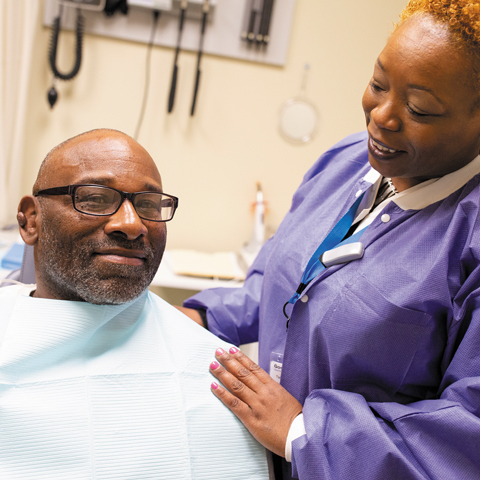 The Duke Endowment has begun funding in oral health in North Carolina and South Carolina using a three-part strategy of supporting system reform and policy change; promoting prevention by expanding school-based oral health services; and improving medical-dental integration models.